State Treasurer Clint Zweifel speaks to the St. Louis Regional Chamber on Friday, March 13, 2015. What came from those face-to-face discussions was the Small Business Relief Program, a public-private partnership that’s given out roughly $700,000 to businesses in Ferguson, Dellwood and St. Louis. It’s one of several funds to help businesses that suffered damage from vandalism, arson and looting over the past few months. “We actually have to inject more human decision-making,” Zweifel said. “When we elect people, they have to be in a position where they’re actually making human judgments to get things done. Not every problem, not every opportunity, not every solution that we have is going to fall into a box that’s pre-prescribed. In response to a question about whether the relief program was going to be enough to help the North County businesses, Zweifel said the fund should be used as a touchstone for larger conversations about educational funding and disparities. It's clear, Zweifel said after his speech, that "we have a long way to go to build the inclusivity that we need in this region." It works like this: If somebody keeps a certain grade point average in high school and college and performs community service, the state will pay tuition and fees for a Missouri college or university. Both Zweifel and Gov. 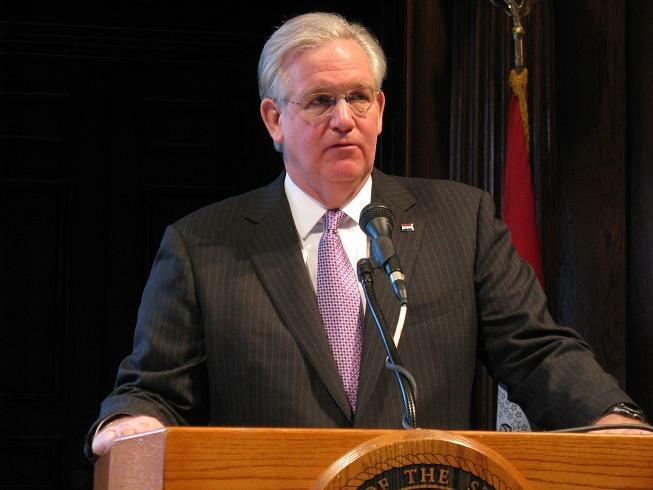 Jay Nixon have been talking about the plan since they campaigned for their respective offices in 2008. Clint Zweifel's speech to the St. Louis Regional Chamber. “And [it’s] a promise to employers, especially, that Missouri recognizes the need for a high-quality workforce and is willing to make the long-term investments necessary to provide it,” Zweifel said. At last week’s Democrat Days in Hannibal, Attorney General Chris Koster embraced Zweifel’s proposal – and suggested raising the state’s cigarette tax to pay for it. When asked by an audience member about how the program would be funded, Zweifel said: “It’s important that we don’t get into a situation where we’re so busy talking about how to fund something before we talk about and really embrace the idea itself. Term limits bar Zweifel from running for a third term as treasurer. And that’s naturally sparked speculation about his political future. The late auditor, Tom Schweich (pictured here at his victory party), was a big fan of the Rolling Stones, said Treasurer Clint Zweifel. Would Nixon appoint Zweifel to replace former state Auditor Tom Schweich? That would in turn give the governor a chance to appoint a new treasurer. “I’m happy being treasurer and will be serving until 2016,” he said. Zweifel also recounted how Schweich told him about how much he had enjoyed a Rolling Stones concert. Zweifel told Schweich that he also liked the classic rock band, but, said Zweifel, "I don't think he believed me because I couldn't name all of my favorite albums" or "what years they were released." On a more serious note, he added it was important to reach out to Schweich’s family and friends in the weeks and months ahead. “It’s often those times when things die down that it’s hardest for the family,” Zweifel said.